Passionate about dance since the time she got in her senses, Deepika is a professional dancer, choreographer and teacher. Born and raised in Delhi, she actively participated and performed at several cultural and dance events throughout her schooling and college time. Realizing her passion she took up dance professionally and joined The Danceworx Performing Arts academy and Repertory Company in India and got trained under renowned teachers from all over the world in different styles like Jazz, Ballet, Contemporary, Yoga etc. Being in the company, she also choreographed and performed in various bollywood movies like Dhoom, Aisha and Bhoomi and corporate shows like Toyota, Hennessy, Microsoft, CNBC, Zoom and many more. She moved to Bay Area in 2011.Knowing & working with Shaira back in India, she has found DI as her new home where she is continuing her passion and fulfilling her dreams.Doing that she has performed with DI at various events like Asha Stanford Holi, Google Holiday Party at San Francisco Design center, VTA commercial and many more. 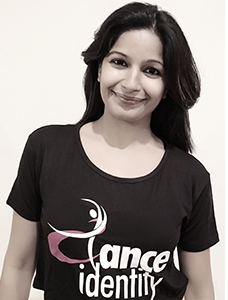 She instructs various classes at DI, YMCA and Fusion after school and also does private choreography lessons for special events like wedding, sangeet, birthday parties and other production houses. In her free time she likes to explore new places and go for hiking, camping and skiing or watching movies and relaxing at home. Being an adventurer she has also done sky diving, river rafting and bungee jumping.